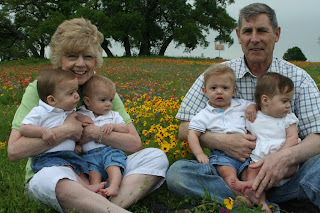 Grandma & Papa's Four Little Wild Flowers! 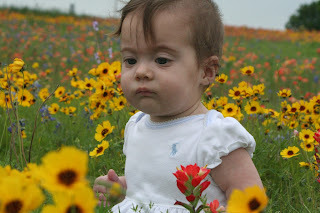 With Mari's parents in town for a week, what better time to enjoy a true Texas treasure - wildflower season. 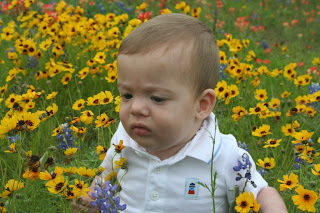 Just drive along any Texas road during spring and you'll see fields of brightly colored flowers, including bluebonnets and indian paintbrushes. Mari, Tim & Dawn packed up the gang in the 'burban and headed for brighter pastures in Brenham, home of Blue Bell, the best ice cream in the country. Anytime Mari and her dad are together, you can bet ice cream will be involved. Unfortunately I was working and missed this trip, but they captured some beautiful photos. 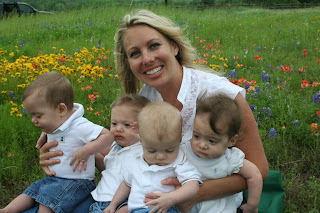 As you can see, the babies are all doing great at sitting up on their own. Sophia is starting to show some musical interests. When we play music, she gets on hands and knees and wiggles her hips. And Mari's mom noticed that when she would sing to her, Sophia starts to sing along. Next stop, American Idol! Finn eats like a linebacker! He will chow down 8 oz of formula at every feeding and still have room for solids. 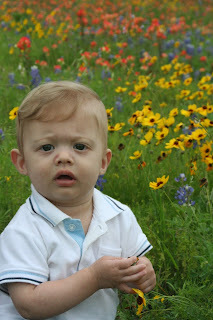 Pretty crazy that we used to have to force feed him just to take just one ounce! He cautiously studies everything around him and is quite independent during playtime. Noah is a wild one, a little ball of energy! He doesn't try to crawl, but who needs to when you can roll from one side of the room to the other. Put him in the Exersaucer and watch out...both arms and legs are flailing as he crashes from side to side, grabbing onto any toy in sight. 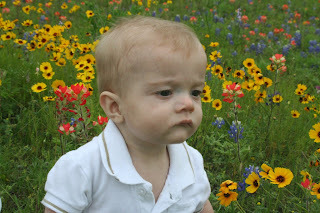 Needless to say, roadtrips to see flowers are not his idea of fun. Cohen is going commando...crawling that is! Luckily, he doesn't venture too far; just likes to steal all the toys from the others. Once he does start venturing out more, we'll have our work cut out with babyproofing because he grabs everything and puts it right into his mouth. Mari found him looking out the window the other day and he was chewing the paint off of the window sill. Beautiful pictures! You have your own gorgeous garden of blooms-what a bouquet of blessings. Each unique creations. It's been a couple weeks and I'm pleased to see all the updates. God is GREAT!